+ listings of hundreds of Futurist broadcasts. The introduction and annotation of the gloss by the translator places Masnata’s contribution within the context of politics and science in Italy in the 1920s and 30s. Analogies drawn between paroliberismo and quantum physics will be of particular interest to text-sound and language poets. The book has 20 plates, including photographs from Masnata’s personal scrapbooks. 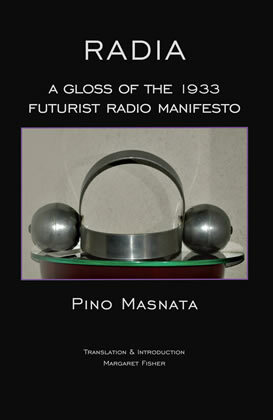 Appendices include translations of nine of Masnata’s radio sintesi never before published in English, a translation of Marinetti’s radio reportage of Italo Balbo’s triumphal return from his 1933 transatlantic crossing, and a first-ever catalogue of hundreds of listings of Futurist radio programs and broadcast-related documents by and about the Futurists — photographs, reviews, articles, photographs, cartoons, and advertisements. Your Futurist library will not be complete without this volume. Giuseppe (Pino) Masnata (4 August 1901–22 November 1968). A surgeon, poet, dramatist and soldier, Masnata was a complex artist whose prolific and original work was marked by psychological depth, methodical training and poetic rigor. He joined the Futurists in Milan just after WWI at age eighteen, entering the movement during a transitional period that resolved into what is called in retrospect the Second Futurism, timed more or less with the relocation of Futurist headquarters from Milan to Rome. By the 1930s he was highly regarded as Marinetti’s chosen right-hand man, having served alongside Marinetti as battalion medic in Africa during the Second Italo-Ethiopian war. He was named National Poet-Champion by the Second Futurist Congress in June 1933 and in September invited by Marinetti to co-author the 1933 Futurist Radio Manifesto. His book of poems, Canti fascisti della metropoli verde (Fascist Songs of the Green Metropolis) came out in 1935, the same year he wrote the essay Il nome radia (RADIA not radio) to explain the inspiration and intention of the Futurist Radio Manifesto. Masnata stressed the importance of original form and structure over content. His willingness to treat psychological content contrasted Marinetti’s aims for Futurist drama, “We are not concerned with producing dramas of humanized matter. It is the solidity of a sheet of steel that interests us for its own sake . . .” (Technical Manifesto of Futurist Literature, 1912). With radio, however, the attention to psychology was not optional. Radio drama required the participation of the listener, whose imagination and interpretation, beyond the reception of sound waves, were essential to the realization of a work of art. Marinetti described his lieutenant’s work as sui generis. Masnata wrote a number of radio sintesi (brief, condensed works) and radio dramas in the 1930s and 40s, only one of which was broadcast, the fifteen-minute Tum tum ninna nanna, renamed Il cuore di Wanda (Wanda’s heart) for broadcast 20 December 1931. This collaboration with composer Carmine Guarino secured Masnata’s reputation as a radio artist. Billed as the first Italian opera written specifically for radio, Tum Tum was humorous, spare, conceptually rigorous, and concise. Masnata’s other radio sintesi, include Il bambino, Fox trot, Rosa rosso, L'aviatrice, Gaby Angelini, Uno schiaffo, Ricerca sperimentale, Il fischio, Beethoven (translated in this volume RADIA) and La Bambina ammalata (The Sick Child). Margaret Fisher, Ph.D., is an independent scholar and artist. Research for RADIA was partly funded by an Andrew Mellon post-doctoral fellowship at the American Academy in Rome. The work stemmed from her groundbreaking study Ezra Pound’s Radio Operas: The BBC Experiments (The MIT Press, 2002). With co-editor Robert Hughes she has issued “The Complete Music of Ezra Pound,” a 5-volume set of annotated performance editions.